When you live in Indianapolis, your friends and family across the U.S. aren’t too far away! Half of the country’s population is within a day’s drive. Known as the Crossroads of America, Indianapolis is easily accessible by any of its multiple interstates branching from the city in all directions. You can be in Cincinnati, Chicago, Louisville, or Columbus in under three hours. If your destination is outside the Midwest, flying might be more your speed. The frequently lauded Indianapolis International Airport offers 145 nonstop and direct flights to more than 42 destinations across the country and around the world every day. With the foremost security and security technology, competitive airfares and a no-delay status, the nine-airline airport attracts more than eight million passengers each year. 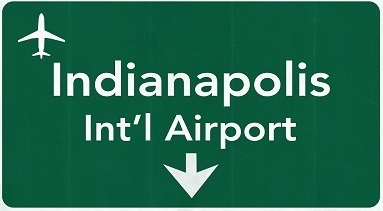 Get flight, parking and transportation info from Indianapolis International Airport. America’s 14th largest city, Indianapolis is easy to navigate with its simple grid-like street pattern. Whether you’re riding to work or merely taking a trip through the downtown district, you’ll experience less of the normal urban traffic congestion thanks to the superior roadway systems throughout the city. No problem! Popular ride-share companies Uber and Lyft are both active in Indianapolis. Just download their apps to your phone to get to where you need to go. You can also rent an electric car by the hour from one of Blue Indy’s 200 stations throughout the city. Indianapolis has also made adding bike lanes to its streets a priority over the past few years. See a map of bike lanes throughout the city, as well as more information about getting around Indianapolis on your bike. You can also rent a bike from Pacers Bikeshare. Indy’s public transportation system, IndyGo, offers bus routes throughout the city. A new rapid transit plan is in the works that will significantly improve bus transportation in Marion County. The first phase, the Red Line Bus Rapid Transit (BRT) project, will run south from Broad Ripple to the University of Indianapolis, and is expected to open in 2018. Get driving directions to Indianapolis. Find driving distances between Indianapolis and major U.S. cities. Check out the traffic situation before venturing into the city.